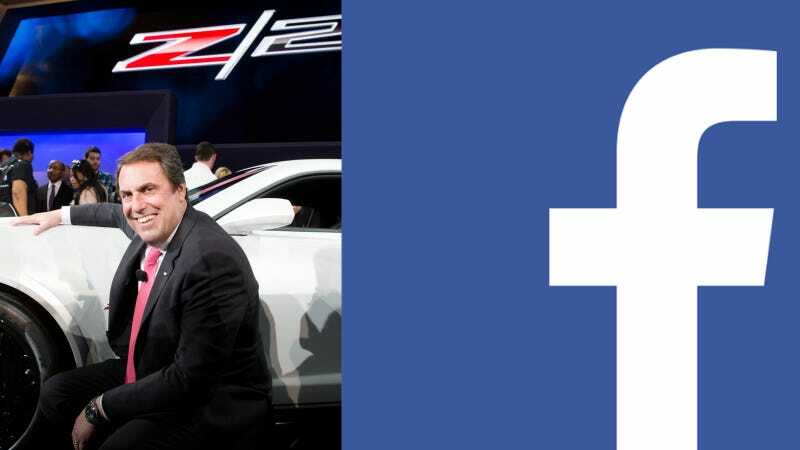 GM's relationship with Facebook could best be described as "It's complicated." First they pulled their ads off the 'book, and then they decided to come back. And don't forget the drama with ex-CEO Fritz Henderson's daughter. Now GM North America chief Mark Reuss has suspended his account after using it to respond to a recent story on their market share. The Treasury took a majority stake in GM but has been rapidly selling down its shares in recent months and expects to sell off the last of its holdings by next April – with the latest government report estimating taxpayers will ultimately lose about $9.7 billion on the bailout. [...] GM’s slide has come as a surprise to many analysts – and a disappointment to the maker itself – considering the widespread praise received for new models such as the Cadillac ATS, which was named North American Car of the Year last January. Meanwhile, GM has been lauded by third-party observers such as Consumer Reports magazine and J.D. Power and Associates, for its sharply improving quality. But the company has failed to gain market share again this year. In fact, GM market share is down slightly despite Chairman and CEO Dan Akerson’s prediction back in January that the maker would gain a bit this year. It's a surprising development, indeed, especially considering the high quality of the aforementioned ATS, as well as the CTS, Corvette Stingray and Chevrolet Impala, among others. Fact: In mid stream of introducing 28 new models, GM has gained a half a point of retail share, and reduced dramatically fleet dependance to drive resale and residual value to build back the brands. GM now sells more vehicles with 4 brands than 8, and grown retail share and dealer profitability–driving margins to 9.3% in Q3. As mentioned, each new model is award winning–and models such as the CTS and Corvette–along with month 2 of Silverado and Sierra in full swing. Our Average Transaction Prices (ATP’s) are industry best, and incentive loads in check. No excuses–but NA is disciplined, focused, and executing. Last month we ran mid 18% share as the plants turn new product and the pipes fill. Exiting BK with the oldest portfolio in the industry took discipline and product focus–nothing worthwhile happens in one year or day or week of share reporting. We have one shot and we are doing it right–with great dealers and facilities. And now Reuss's Facebook account has been deactivated. Did he get second thoughts about what he said, or did someone higher at GM not take kindly to Reuss's aggressive defense of the General's place in the market? GM, for their part, insists that's not the case. "Mark made a personal decision to deactivate his account," GM spokesman Terry Rhadigan told Jalopnik. It was not related to any recent posts he did, and it was his sole decision." Okay, fair enough, although the timing on such a decision strikes me as a little odd. But if Reuss did want to stick up for GM on Facebook, he wouldn't be alone. As the WSJ notes, Tesla Motors CEO Elon Musk is a regular defender of his company on Twitter, his personal blog and other online outlets. And Ralph Gilles at SRT is hardly one to mince words online. Why shouldn't an executive use social media to respond to critics? It's as good a medium as anything these days.